Following the general instructions from this wise fellow, I recently installed our two new colonies of bees. The main (and important) distinction of this fellow’s method versus others is the lack of a “bump” to knock/pour the bees out of their delivery boxes (pictured nearby) into the hive. By avoiding this bump, you can also completely avoid much of the “required” protection gear. 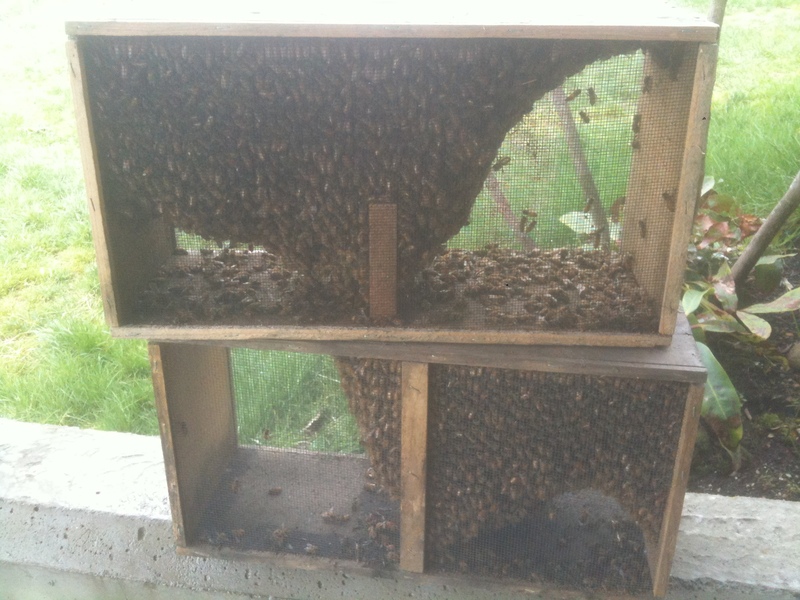 I installed our bees, messed around three times pulling frames in/out, and removed the queen boxes all without any more protection than a pair of gloves and long sleeve shirt. The only modification I added to the video instructions was to slide a board across the opening as I pulled the feeding can out of the delivery box’s top. This kept the majority inside the box while I got the queen installed with her marshmallow. 24 hours later the marshmallow was gone. Great, low stress way to install a new colony!